Last month we left our headquarters in the South Downs countryside and ventured north, to the cities of Manchester and Coventry, to put on our immensely popular free showcase events. Both the Coventry Transport Museum & the Imperial War Museum in Manchester provided great and unique locations for our showcases to take place. Scores of you took the opportunity to see how we can help you improve workplace well being and productivity and decrease sick days. 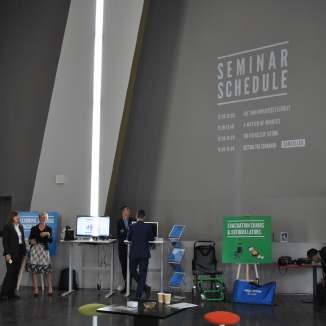 Information-packed seminars throughout the two days covered a wide variety of topics, from the hot topic of active working to health and safety responsibilities for business leaders. Our stand-out speakers included Brendan Mahood, who discussed the value of defibrillators in the workplace and the wider community. Brendan has worked in the medical device business for more than eight years. Consulting ergonomist John Ridd talked about the many health benefits of alternating between sitting and standing at work (see John's webinar on this subject here), and Roy Cochran from Bupa covered the risks associated with sedentary behaviour and some strategies to help reduce sitting time. Business development manager Jacqui Burns revealed how to deal with hidden disabilities in the workplace. Our leading consultant Katharine Metters detailed changing working practices and asked: Are your employees flexible? Workrite’s Ryan Church and his team demonstrated exciting new developments in e-learning software, accident management and risk management systems, advances in health and safety consultancy and training. Our Office Environment colleagues David Kirtley and Julian Millar showcased the DeskRite Evolve sit-stand bench desks which are centre stage in our active working campaign. Now, as our events calendar for 2015 comes to a close we’d love your feedback. Perhaps there was an event you’d have liked to see more of, or there’s a totally new topic you think we should cover? Comment below if you have any suggestions – We would love to hear from you!